The village of Nellim is a village of a great natural beauty, surrounded by northern hills. 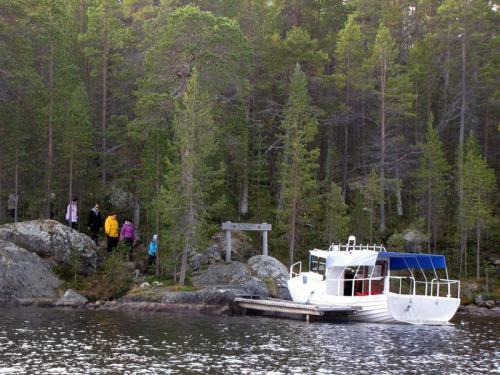 It is located on the coast of Lake Inari, along the old Arctic Ocean road to Petsamo. The unique village and its diverse nature provide wonderful experiences for all seasons. Lake Inari tempts to fish and to go boating in summer time. The wilderness areas of Kessi and Tsarmi fell, with their lakes, rivers and rapids, offer great opportunities for hiking. In winter time, it is time for cross country skiing, ice fishing and motor sledging. Winter net fishing, with a local fisherman, is an unforgettable experience. Nellim is called a ‘village of three cultures’. The inhabitants of the village consist of Inari Sami, Skolt Sami and Finns. The village is a meeting point of the eastern and the western Sami cultures. There are about 250 inhabitants. Reindeer herding, fishing and forestry still play a role part in terms of livelyhood in the life of the locals.